Hello Dice Masters Fans! 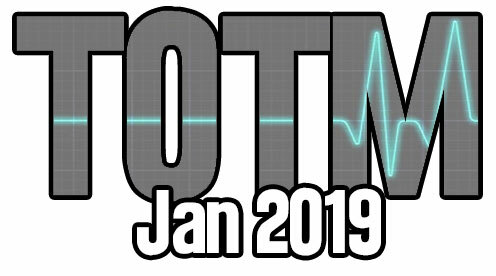 Last night, we kicked off the Team of the Month (TOTM) Competition for 2019. This time around, we decided to flip the game upside down. The goal of this build was not to reduce your Opponent to 0 life, but to bring yourself up to 20 life. If you want to read about the details of the build, you can check out the original article here. I managed to record some of the matches this time around, but they are still on the Editing Room floor. I wanted to get the results up ASAP. Video to follow. When I played this format in my local store, I went with a SR Ultraman/Long Live the Resistance Team. I decided to use the same bones, but add in some tools that did not exist a few years ago. SR Mimic showed how useful he really is by making the Ultraman machine work even more efficiently. This card is so versatile, and is quickly becoming one of my all time favorite cards in the game (don’t worry Rarecrow… you will always be #1). 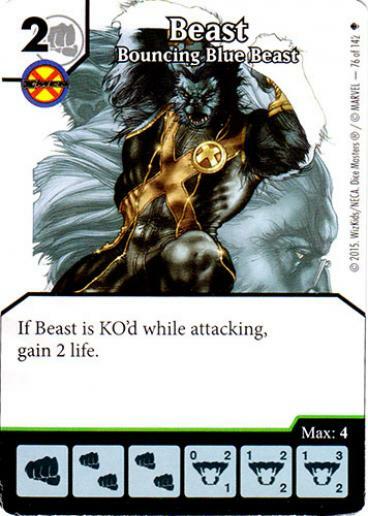 Beast proved to be one of the more popular characters on the other build. A nice cheap character that is fairly easy to KO for some decent life gain. There was a little controversy with him at the start of the tournament, as to whether his ability is a “When KO’ed” ability or not. We ruled that it was not, and could not be doubled with Absorbing Man (who also showed up on many Teams). Even with the ruling, Beast still proved to be a good player in this Tournament. The Rare Harley Quinn was another piece that gave fairly consistent life gain/loss. She would help keep your Opponent in check every turn with a small swap of life. Mystical Elf was a blast from the past that also made an impact. She has an excellent “When KO’ed” ability to not only gain life, but to Prep the die of your choice. I haven’t played with this one in such a long time, but it is such a great ability. Absorbing Man made her even better, by netting you 4 life per KO. To make the Elf even more effective, she was paired with the Rare Amber Golem. 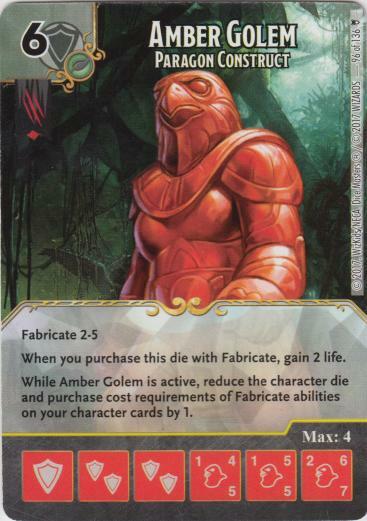 Now, you gain life from the KO of the Elf and from the purchase of Amber Golem. Potentially, if you were to Fabricate 2 Mystical Elves with Absorbing Man active, you would easily gain 10 life in one shot. Not bad at all. The big surprise for me was Power Girl. Under normal circumstances, this is not really a useful card in Dice Masters. However, this Format proved that every card has its place. She was actually pretty good at gaining life. I can honestly say that I never thought about her for this. Good job finding this hidden gem. I think that the biggest surprise of the night came from the cards that did not show up. No Jinzo. No Lyssa Drak. Everyone kind of focused on gaining their own life over knocking down their Opponent. This was awesome as it allowed for the combos to shine. The one Team that I did not get to see work, was Laurier’s Team that had Jarvis on it. Any excuse to use those dice is a good one. Maybe he can chime in and leave a comment describing his crazy machine. So, things are being a done a little differently this year. We are giving out points during the year and posting them on the overall Leaderboard. 3 points just for showing up. 3 points for a win/bye. 1 point for a tie. Nadda for a loss. Round 4 (Exhibition, results not recorded… even though it would put Ben up with Laurier). Congrats Laurier for earning the Gold Star this month. Thank you to everyone who showed up for a fun night of Dice Masters. This was a fun change of pace and allowed some not-so-common cards to shine. Looking forward to the next one. See you at the next TOTM! I was robbed I tell you! It really had multiple strategies in one. I won’t make it as long as my usual articles, but in short: Jarvis + Absorbing Man was my primary life gain engine. 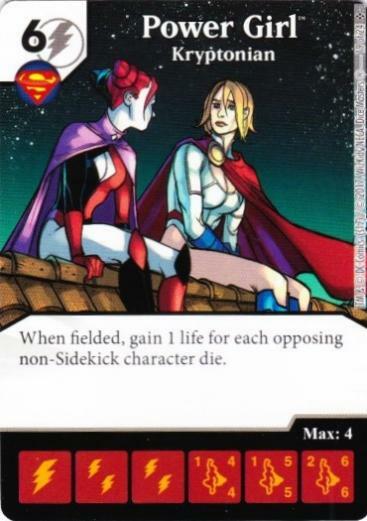 Field tons of characters, usually sidekicks (using Instant War if PXG isn’t around), then field Jarvis, repeat the effect with Absorbing Man, gain tons of life. One turn, I gained 18 (!) life this way. 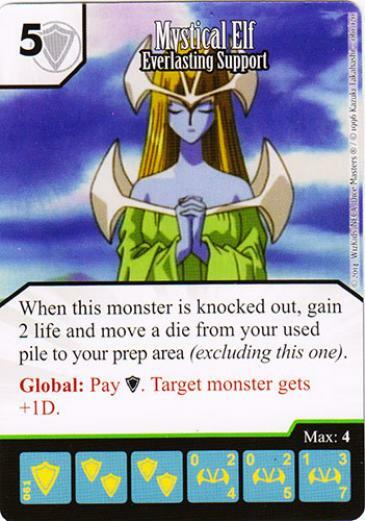 Alternatively, UC Beast, using the Blue-Eyes global after he’s declared as an attacker, is an easy (if slower) life gain strategy (not to mention that the Blue-Eyes global really helps me purchase my expensive dice, and that it helps me use “when fielded” effects consistently). Another idea is using Vampire Wolverine alongside Jubilee. Using Instant War, I force my opponent to field sidekicks, which I then KO with Jubilee, triggering Wolverine’s damage + life gain. As for Earth X Cap, he can give me life if I’m behind, and if I time things right using Instant War, I can get Underdog pretty easily (this time I’d have Jubilee KO my own sidekicks to get me behind on characters). I once used this to field Absorbing Man instantly after purchasing him, when I had a Jarvis ready to field. That Underdog is shockingly consistent when you use Instant War + Jubilee, believe it or not. As if I needed any more reasons to like this card. As for the rest, Shriek was only there in case I ran into nasty control cards, and Resurrection was there for ramp and bag control when PXG wasn’t around. It was certainly a ton of fun to run this; I loved the format, and might just look into it for a local event sometime.